Stay tuned for upcoming events for The Silent Words in near future. 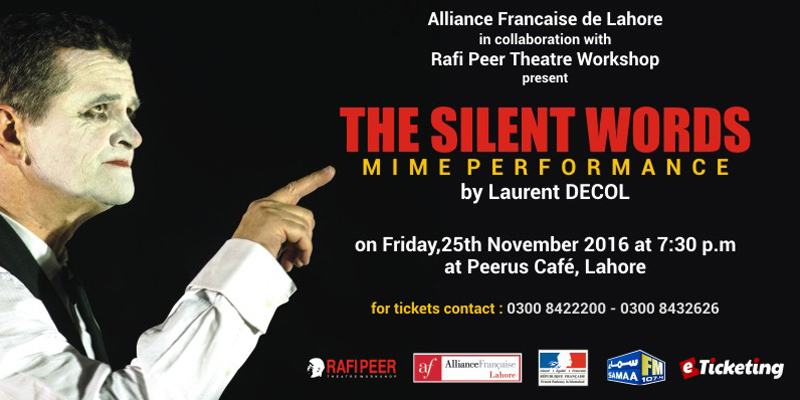 The Silent Words, a Mime Performance by Laurent Decol will be staged by Alliance Francaise de Lahore in collaboration with Rafi Peer Theatre Workshop on 25 November 2016 at Peeru's Café in Lahore. World renowned French mime artist Laurent DECOL will act from 7:00 PM till around 10:00 PM. This performance will be presented on the second day of the 3-day workshop. Laurent Decol had the privilege of being the student of the Marcel Marceau of worldwide fame. He graduated from and subsequently became a Professor at the Marcel Marceau Paris International School of Mimodrama. He also did graduation from the Institute for Researching the Actor in Holstebro (Denmark). He is also an Actor and is Director of a Theatre company. In the language of mime and gesture, Laurent DECOL's mono-performance "Words of Silence" is a reflection on twelve of the existential human issues such as love, life and creativity. Communication is universal as no speech is involved in this act. He has completed several thousand performances and workshops in around 100 countries. Best Viewed at 1024 x 768 pixels and above. This Page loaded in 0.09101 seconds on Tue, Apr 23, 2019 (21:32).